Johnny Tallbear said he was “happy” to be released after his conviction was vacated by the Oklahoma County District Court. 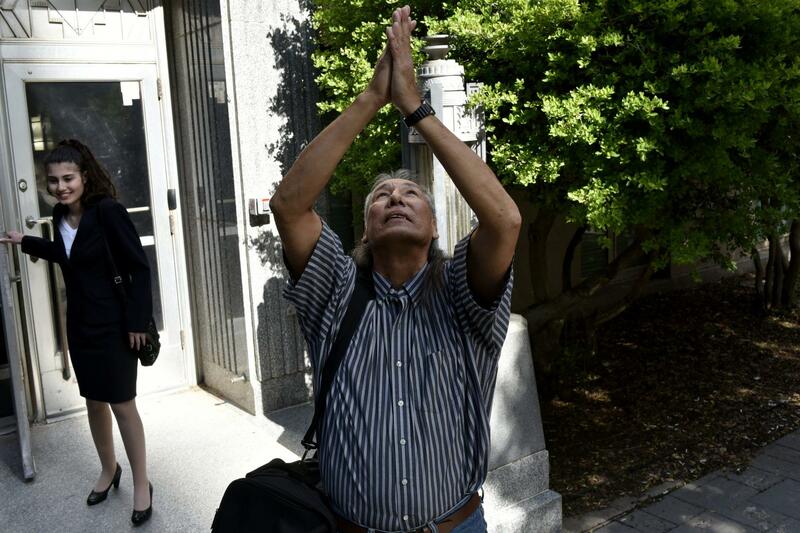 Johnny Tallbear has proclaimed his innocence for 26 years. Now, people are listening to him. StateImpact's Quinton Chandler reports on the exoneration of Johnny Tallbear. DNA tests ordered by the Innocence Project led prosecutors to ask a judge to dismiss a first-degree murder charge levied against Tallbear, which led to his conviction and life-prison sentence in 1992. Prosecutors at the time claimed Tallbear fatally stabbed and beat a homeless man known as “Pops” with help from a second man who was never identified. Karen Thompson, an attorney with the Innocence Project, and Oklahoma City attorney Douglas Parr asked to test Tallbear’s DNA against blood samples collected from the crime scene. The blood did not match Tallbear’s DNA, and those results prompted the Oklahoma County District Attorney’s Office and Tallbear’s attorneys to file a joint motion to vacate the conviction Monday. The court set Tallbear free the same day. Tallbear left the Oklahoma County courtroom shackle-free on Monday with a wide smile. He told reporters he faced “many trials and tribulations” in prison and he was “happy” to be out. He called for prison reform and said many of the people in prison should be given another chance. Tallbear’s legal team says eyewitness testimony and forensic evidence provided by discredited Oklahoma City Police Department chemist Joyce Gilchrist led to his conviction. Serological Research Institute in California tested the blood from the case and found two unidentified men’s DNA, but Innocence Project staff say no physical evidence pointed to Tallbear. Tallbear’s attorneys also pointed out that a physical therapist testified 26 years ago that Tallbear was mostly confined to a wheelchair at the time of the murder following a surgery to remove gangrene from his leg.